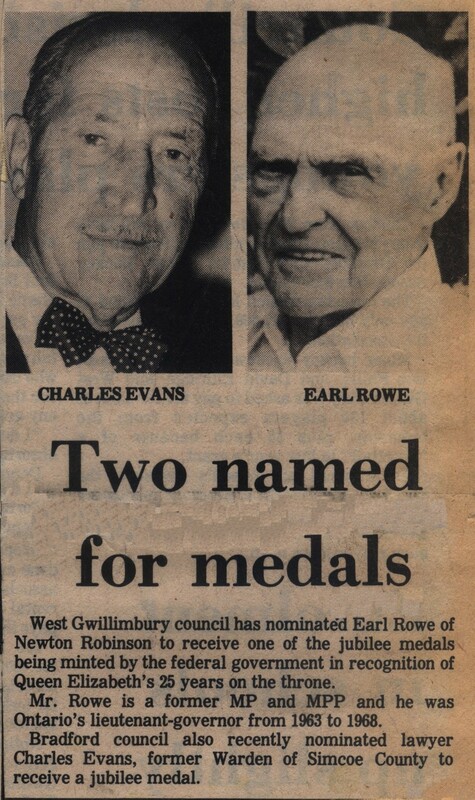 " West Gwillimbury council has nominated Earl Rowe of Newton Robinson to receive one of the jubilee medals being minted by the federal government in recognition of Queen Elizabeth's 25 years on the throne. Mr. Rowe is a former MP and MPP and he was Ontario's lieutenant-governor from 1963 to 1968. Bradford council also recently nominated lawyer Charles Evans, former Warden of Simcoe County to receive a jubilee medal."